For free dog food, free clicker trainer, free puppy food sample and other dog freebies visit the flat-coats.co.uk Free Dog Food page. Flat-coated retrievers came into their own in the shooting crazed 19th Century. The breed originated in the UK from imported Newfoundland Wavy-Coated Retriever dogs which were then crossed with Setters. The Flat-Coated Retriever was originally bred as a working hunting retriever to fetch shot birds that landed in the water, though they make natural gundogs in and out of the water. Breed Standard colours are black and the rarer liver-coloured. See the Breed Standard Description page of The Flat-Coated Retriever for more information. Flat-coats make great pets due to their great nature - highly affectionate, gentle, intelligent and obedient. They enjoy an active life and love to play - especially fetching and carrying objects. Flat-coats love to please and are very attentive dogs who await their master's commands eagerly - Lucy loves to carry shoes and slippers and distribute these around the house and garden awaiting a reward or showing her eagerness by confidently wagging her tail. Flat-coats are such loyal, happy optimists and are very cheerful dogs, which makes them such loveable and endearing gregarious companions. You can never be sad with one around. However if left alone they will become quite despondent and unhappy. They just thrive off attention and exercise. Whilst my four legged companion sat beside me I wrote a book which tells the story of The Drummer Boy . 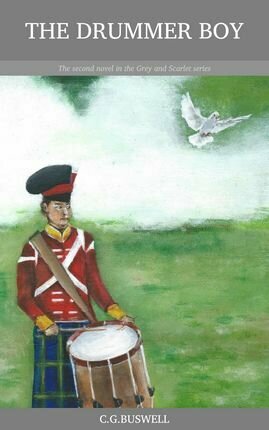 This novel is about the ghost of a Gordon Highlander Drummer Boy from the Battle of Waterloo who haunts a modern day army nurse. Flat-Coated Retriever (Comprehensive Owner's Guide) is a detailed flat coated retrievers book, published by Kennel Club Books, which will prove useful to any owner. Chapters include the history of the Flat Coat dog, advice on choosing a puppy, health care and training tips. If you would like to add your text, image, product, service, website or photo to this flat-coats page then please Contact Me. Be warned though - do not scold flat-coats too much during training or when they are naughty or they will go into a deep sulk. Lucy gets a real black mood if chastised and will, without fail, pee on the floor overnight if I have told her off during the day, or not given her enough attention. Well that is my excuse for giving her a brush in the evening and a large kiss and cuddle before bedtime. In fact the wife gets quite jealous of the attention I lavish upon Lucy in the evening that she calls her the "other woman" in our marriage! Most enjoy being around children due to their calm, easy going and friendly nature and Lucy sees herself as one of them! Lucy will allow the children to tease, poke and prod her without showing any ill nature towards them. Flat-coats have often been described as the Peter Pan of the dog world - they look eternally youthful and are always playful. Most dogs will maintain their gorgeous black sheen coat through to old age, though Lucy has a few grey hairs in her beard! Crufts Winner 2011 proved that Flat Coated Retrievers are the Peter Pan of dogs when nine and a half year old Flat Coat Jet won the Crufts 2011 Best Gun Dog Category and then went on to become the overall Crufts winner for 2011 taking the Best in Show Crufts 2011 award. Jet was owned by Iain Ross from Edinburgh, Scotland and showed at Crufts by his breeder Jim Irvine from Queensferry in Scotland. Crufts 2011 took place at the Birmingham NEC in March, with Jet the flat coated retriever being crowned the Crufts winner 2011 on Sunday 13 March. Over the four day event there were 21,422 dogs competing in Crufts 2011 with a live audience of 138,000. The owner of flat coat Jet described him as having a "happy outgoing personality". The Kennel name of Jet was The Kentuckian. Like most flat-coats, Lucy loves the water and is an agile and energetic swimmer. When she spots a rabbit or a large bird she adopts the striking, alert and elegant pose that make gun dogs so captivating. As with most dogs they can pout a sad face, but overall they look noble, elegant and intelligent. If you're after a guard dog then I'm afraid a flat-coat is not for you - they are far too good natured and friendly and are more likely to ask for a tickled tummy than bark at strangers! General history of the dog. In the novel The President's Daughter by Jack Higgins, Jake Cazalet, the President of America, has a flat coated retriever called Murchison who loves nothing better than a long walk along the beach. Site contents copyright Flat-Coats.co.uk - All rights reserved.